I’ve been avoiding ‘hair base hairstyles’ far too long, and I want to embrace them this year. Some hairstyles needs hair base to even out the hairline, but my hair color of choice (light Blonde) never matches any hair base in SL. I’m still waiting for my favorite hair brands to release their own matching hair bases. I have a question for all the hair base lovers and PS experts out there! When you find a hairstyle with similar/matching hair color as the hair base, is the hairline suppose to be smooth or is it still jagged? My Before picture is what it looks like to me in SL, and to me, that’s not wearable. I blurred the hairline in PS, but I’m not happy with it (I’m a PS editing newb). What are some of your favorite hair base hairstyles? Who has matching hair bases for their hair? Am I just wearing it wrong? Help me SL! I use Tiny Bird a lot for my bases – mostly just to fill in the spaces in some hair styles. The place where the hair meets the base is only as jagged as the hair itself makes it be. If they have feathery edges it’s fine, but otherwise the line is very very clear. i like to use the tiny bird bases too because they seem to fit nicely with most of all the different hair textures out there. Okay maybe it’s just me, but alot of hairbase styles that I use to buy came with a hair base for the hairbase style hair. Errr…even some places come with tattoo hairbases now so you don’t have to worry about the hairbase “you” have. Honestly the places I buy hair from have them, so I’m not to keen in understanding how you are not finding good hairbase style hairs. Cause that hairbase that you have on above…would just not cut it lol. Perhaps you can find a good blonde hair tattoo layer at Amacci or somewhere in a blonde you like and then tint the hair to match the base. This is a good idea, except I don’t want to tint Light Blonde hair. I just want to remain Light Blonde and have a perfectly matching hair base, LOL! that is the problem with tattoo hairbases. you pretty much need several. i wear mostly black, and you would think black will match all black hair, nope. the textures and colours make a big difference. with the pic you showed, the hairbase is not made to go with the hair, it’s just a hairbase. you need to find hairbase tattoo’s made by places that make hair, then the texture and colour will be exact, and you won’t have as noticeable of a line. it’s pretty much just like tattoo lipsticks, they don’t work for every skin, so you need to buy lots to find the right ones. i just bought 2 of the 3 hairbases from booN, they are pretty nice, and have quite a few cute styles to buy for them. the reason i liked the booN hairbases are because they have 3 styles, pulled back low, pulled back mid, and pulled back high, and of course, they are available in every hair colour that they make, but i tried them with other hairs, like from Amacci, and Laq, and they worked pretty good with them as well. in the end, it’s all in how picky you want to be about colour and that line. i understand that, very rarely do any of my hairs go untinted because i want the perfect colour that few hair designers use…lol, even if it is me tinting black hair. Yes, I like very much the boon too and tiny bird, but they don’t work with every hair and I need buy a lot hair bases. I already changed my mind about some purchases because I could not find a nice hair base to go with. I am blond most of times, but I have my brunet moments and I feel its bit easier find good hair bases to darker hairs. i use the hairbase/skin combos from dutch touch with my lelutka hairs that need a hair base and they come out looking really good. i have tattoo layers of hair bases from dt too. Gogo, booN makes hair bases specifically to match their hair colors, and makes them in a nice range of updo styles. The downside for you is that booN has never had a very light blonde. Amacci does have a light blonde hair base that will probably work well for you — it’s very close to the hair colors you wear. Waka & Yuki also makes a few really nice light blondes — they’d work well for your hairstyles. If you’re looking for shaved hair bases, try 99 Elephants or DeeTalez, both of which have blonde shaved options. Aitui does not. As for the jagged edge, as Sedge mentioned, it completely depends on the hair itself. Some hairs are designed for hair bases, and will merge smoothly (whether it’s because they are hairpieces or because the edges are slightly feathered). Some are a little more jagged. 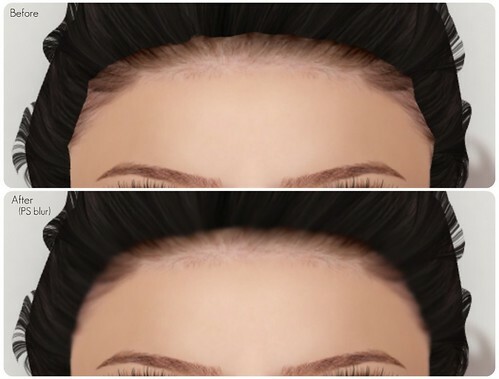 Personally, I always wear my hair base under hair exactly because of what you highlighted in your post: I hate the jagged hairline along my forehead, and a base smooths that out. I like the hair bases at Damsel Fly and Amacci but I use them on a ‘bald’ headed skin I have struggled matching hair base styles to some of the hair based skins. Only a base and hair bought from the same designer would be a ‘seamless’ match I guess. Analog Dog has a huge set of hairbases free. They even come with a side ponytail, also in all colors. They have many light blonde hairbases. Amacci too…. they sell many different shades of light blonde. I think it looks best when I edit the prim hair so it shows as little as possible of the hairbase, it makes the difference between prim hair and hairbase less visible. Because it /will/ be a difference. As it is in your pictures, you could stretch the hair just a little, and move it slightly down so just the thin edge of the hairbase is visible. I saw some guy with a hairbase and a ponytail style hair. His hairbase was drawn long down in the forehead, and v-shaped, and his hair was high up on the forehead and rounded edge… it looked so silly! I just have to say…thank you thank you thank you! Amacci…oh my god…Amacci. Where has that place been all my life for good hair? Haha yay for reading something and finding something new! Oh and Amacci has good hairbases. I dont really use hair bases on my avi cause I’m still using phoenix (only one tat layer) and I save that for my eyeshadow. I did buy a set of hair from I think the blue dressing room, it was by LoQ and the hair was made to be used with a hair base. So maybe try there? The have cute hair and if its still up in the blue dressing room I think it was only 70L. Like the others said, Tiny bird & amacci have hairbases. Amacci has some hair made just for bases and they are having a sale too (I think 89L a pack not 100% sure). Its usually more sculpted hair (like exile) that I have scalp issues with, and its more pulled back styles (like an updo or bun etc) verses long hair thats sort of in your face. I’m shocked if LeLutka doesnt have hair bases since they sell hair and skins. If they don’t I’d def drop the creator with an IM and suggest it. Oh, Laqroki has hairbases (I think you bought those with the eyebrows if I remember the post right from a while ago). Damselfly has some really good ‘hairbase’ styles that include the matching hairbase of course. I personally don’t like their hair textures as much but with some tinting they are passable and there are a few that make it into my regular rotation. One of their newest .. Jolayne … is a gorgeous hairbase upstyle that blends very seamlessly. Why on earth would anybody even try to make a front on a hair intended to be worn with a hairbase? There is very little chance of it looking good. I thought the whole purpose was to have the hair look pulled back without looking big. I don’t wear a lot that have a front. I prefer ponytail/bun attachments. I still occasionally wear some of my hair from Cake that has little wisps built into the front. It looks better than most hairbases to me. Couldn’t agree more! Like the new style from Elikatira, the cute baby hair is prim. Yes, more, please! I have bought my first hairbase styles from Amacci, in the sale and she sells the matching hairbases for her colour sets. I am finding them rather good, actually. Well, Analog dog released a couple weeks ago new hair styles that needs Hair Base, one of this ahir is free in every colour inaginable, and the pack of hair bases is also free. Since it is free, you should give a try, teh pack have several tones of blonds, since almost with until golden look. Also, as far as PS goes, I don’t tend to blur that part, but I do add shadow with the burn tool to even it a bit. I wear the LAQ red hair base with this av, as it matches my hair color perfectly. I have also picked up their blonde and black packs. The blonde only comes in a “golden” tone, not platinum. I have seen the Amacci bases, and they do have a great variety, but have not tried them. Matching colors is essential, though! I have not been crazy about hair styles that are pulled back from the forehead in the past, and have never purchased one until recently. I fell in love with Saskia, Rylan 2 and Midori from Truth. The hairline just looks more natural than any of the others I have tried. I adjust it so that very little of my base shows, but it is a very tedious task!! Try one of those, with a hairbase that matches your color of blonde, and see what you think! Well, for me it’s just simple as “there’s NO very good blonde hair bases” around. Period. I have bought them in many stores. Some are a bit better than others, but they’re not very good. Amacci has some nice ones for their own hair textures. I wear them sometimes for body pics, and they look pretty good but they don’t look that good for close ups. Same with booN. I also like the new ones from Analog Dog. If you haven’t tried yet, there’s a pack of free hair bases and hair attachments to try on. Of course, if you just want to use a hair attachment like a knot, or a pony tail with no hair on the top of your head, they all look nice enough. De La Soul just released their Charlie skins that come with a brown hair base and brows, and I know she also just put out extensions in Blond, Black, Red, and white/tintable. All of the tattoo layers are tintable for the perfect match and (yes I am a male) I use them as well. I put her blog up in the website box if you want to check it out.